Marmite™ – more to it than simply great taste! It’s low in fat, completely vegetarian, contains only 0.6g of sugar per 5g serve and contains five essential B vitamins. Plus, it’s the only yeast extract in New Zealand enriched with iron. Marmite™ is a good source of Thiamin, Riboflavin and Niacin. A single 5g serve provides 50% of the recommended dietary intake of Thiamin and 25% of the recommended dietary intake of Riboflavin and Niacin. Marmite™ is a completely vegetarian source of Vitamin B12. A single 5g serve provides 25% of the recommended dietary intake. Marmite™ is a source of iron with a single 5g serve providing 15% of the recommended dietary intake. In fact, no other yeast extracts or savoury spreads in New Zealand are enriched with iron. Marmite™ is a source of folate. 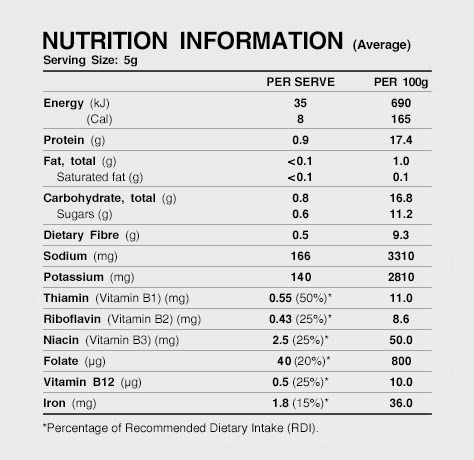 One 5g serve provides 20% of the recommended dietary intake. 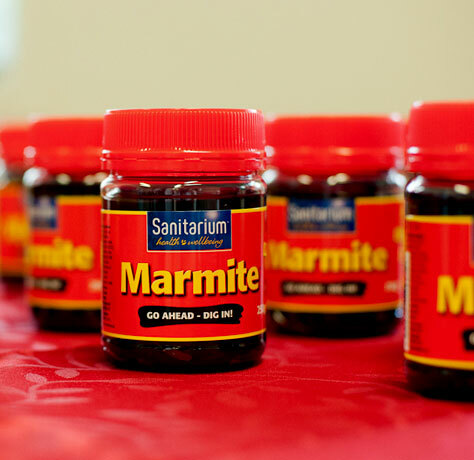 We think Marmite’s the perfect addition to any meal. In fact, we believe a true Marmite™ fan will always find new ways to cram more Marmite™ into their day – check out our Marmite™ recipes and dig in!